Most of what people refer to as “meadows” and complex ecological plantings were pioneered in Germany between the World Wars by Karl Foerster. They have been further developed by Oehme, van Sweden; Dan Pearson; and Piet Ouldolf. The grasses and perennials that comprise a meadow can be either exclusively native to a particular region or can incorporate adaptive plants from prairie and steppe habitats from around the globe. We design for both situations. 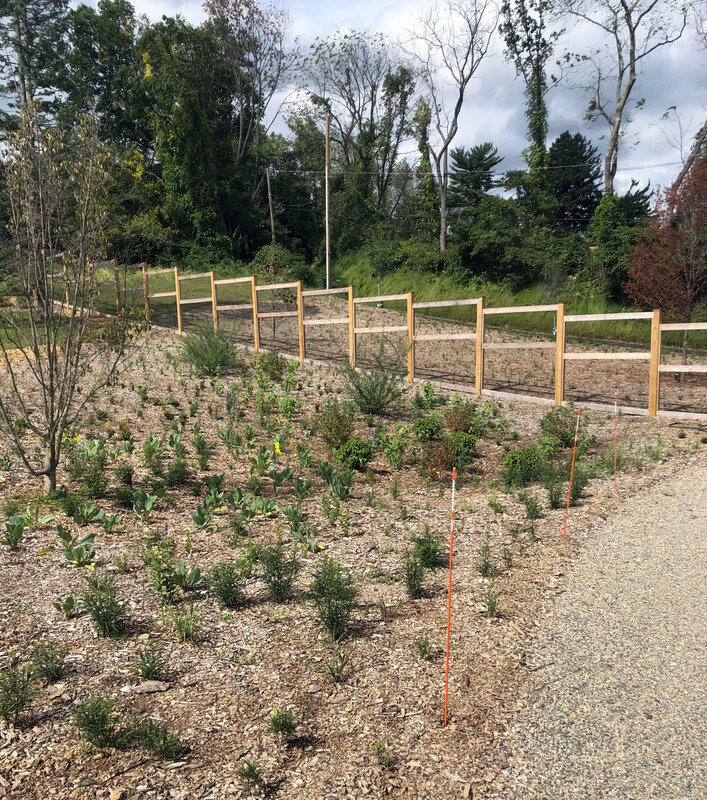 For In Situ (pictured below), located in Redding, Connecticut, we designed a meadow where all the plants are native to the Northeast. Currently, we are working on three new projects which incorporate meadow plantings: the Seattle Waterfront with James Corner Field Operations; a pollinator meadow for the Leach Botanical Garden in Portland, Oregon; and the meadows at Hound Hill, a private residence in north central New Jersey. Each has been designed and will be implemented in different ways. In summer there’s an explosion of Goldenrod at In Situ. At the Leach Botanical Garden (Portland, OR), the half-acre pollinator meadow will include 240 different plants. Every plant has been carefully located on a highly complex planting plan. For implementation, the site will be divided into twenty-foot grids. The plants will be placed in the field based on each grid sector. This is a richly diverse meadow because it is being designed for a botanical garden and will be used for educational purposes. Hound Hill, pictured below, is also roughly a half-acre in size and has a palette of approximately thirty-five varieties of plants. Here, we composed the design on-site, with 8,222 individual plugs (small-sized plants). This approach requires a broad knowledge of plants and the effect each individual species contributes to the design. In addition to physical standards of plant size, form, and color, three additional site-specific criteria were taken into consideration. Plants that stabilize the soils and thrive in moist conditions were selected for the natural drainage swale that runs through the site. A woodland edge along one portion of the field required an understanding of plants that thrive in part-shade conditions. Lastly, the property is enclosed to keep out deer. A fence runs through the center of the meadow, so plants on the outside must be deer-proof while those inside the fence do not. 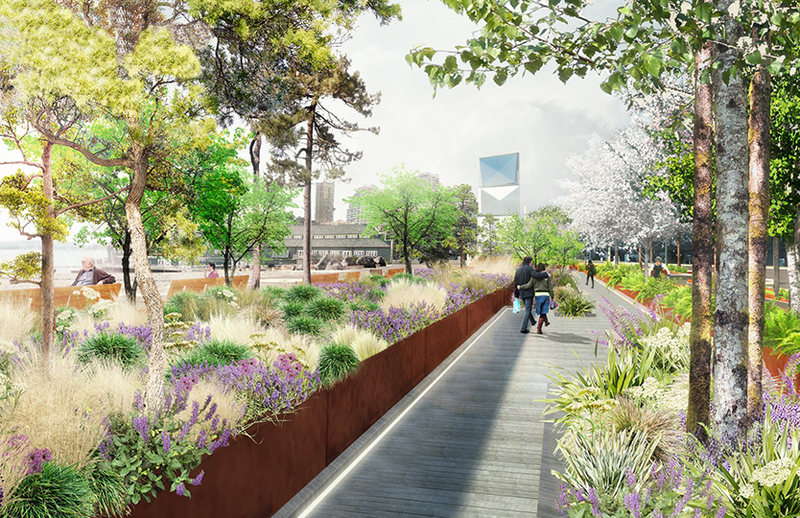 The planting design for Seattle’s new waterfront involves a series of linear bar-like beds, each containing a matrix of three to a dozen species. A larger effect is achieved by stacking up more bars. In the plan, we determined the mix for each bar and assumed eighteen-inch spacing between plants. When the plants are laid out, they will be placed in an even yet random pattern. In all our designs, we assume eighteen-inch on-center spacing to calculate the required number of plants. We generally like linear plant groupings that disperse along the edges and blend one plant group into the next. Each design varies in percentages of perennials and grasses. More perennials equal more color and multi-seasonal interest. To add further dimension to our design, we interplant the meadows with a wide range of bulbs and, occasionally, trees and shrubs. A detailed knowledge of native and adaptive plants and their availability is required to design a successful meadow. These complex and strikingly beautiful landscapes are well worth the effort and give back both aesthetically and ecologically year after year.